So Abraham prayed unto God: and God healed Abimelech, and his wife, and his maidservants; and they bare children (Genesis 20:17). He said, If you will listen carefully to the voice of the Lord your God and do what is right in his sight, obeying his commands and keeping all his decrees, then I will not make you suffer any of the diseases I sent on the Egyptians; for I am the Lord who heals you (Exodus 15:26 NLT). See now that I, even I, am he, and there is no god with me: I kill, and I make alive; I wound, and I heal: neither is there any that can deliver out of my hand (Deuteronomy 32:39). Turn again, and tell Hezekiah the captain of my people, Thus saith the LORD, the God of David thy father, I have heard thy prayer, I have seen thy tears: behold, I will heal thee: on the third day thou shalt go up unto the house of the LORD (2 Kings 20:5). 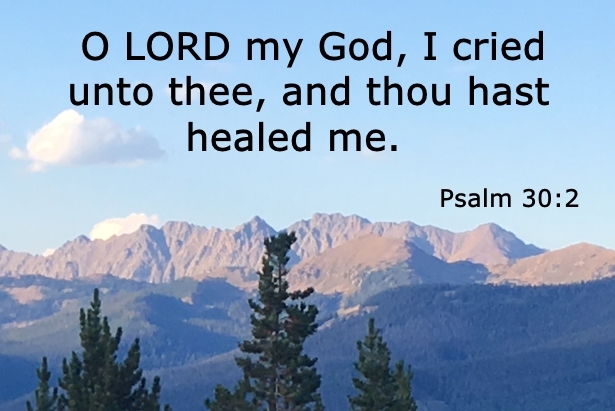 O LORD my God, I cried unto thee, and thou hast healed me (Psalm 30:2). I said, LORD, be merciful unto me: heal my soul; for I have sinned against thee (Psalm 41:4). He forgives all my sins and heals all my diseases (Psalm 103:3 NLT). He heals the brokenhearted and binds up their wounds (Psalm 147:3 ESV). But he was wounded for our transgressions, he was bruised for our iniquities: the chastisement of our peace was upon him; and with his stripes we are healed (Isaiah 53:5). Return, O faithless sons; I will heal your faithlessness. Behold, we come to you, for you are the Lord our God (Jeremiah 3:22 ESV). 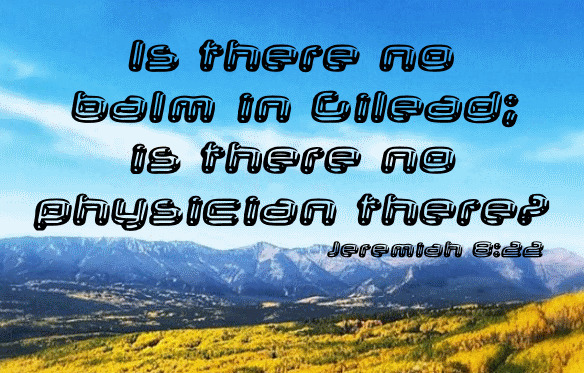 Is there no balm in Gilead; is there no physician there (Jeremiah 8:22)? And Jesus went about all Galilee, teaching in their synagogues, and preaching the gospel of the kingdom, and healing all manner of sickness and all manner of disease among the people (Matthew 4:23). Then was brought unto him one possessed with a devil, blind, and dumb: and he healed him, insomuch that the blind and dumb both spake and saw (Matthew 12:22). And certain women, which had been healed of evil spirits and infirmities, Mary called Magdalene, out of whom went seven devils (Luke 8:2). And as he entered into a certain village, there met him ten men that were lepers, which stood afar off: And they lifted up their voices, and said, Jesus, Master, have mercy on us. And when he saw them, he said unto them, Go shew yourselves unto the priests. And it came to pass, that, as they went, they were cleansed. And one of them, when he saw that he was healed, turned back, and with a loud voice glorified God (Luke 17:12-16). And when he thus had spoken, he cried with a loud voice, Lazarus, come forth. And he that was dead came forth, bound hand and foot with graveclothes: and his face was bound about with a napkin. Jesus saith unto them, Loose him, and let him go (John 11:43-44). But Peter said, “I don’t have any silver or gold for you. But I’ll give you what I have. In the name of Jesus Christ the Nazarene, get up and walk!” Then Peter took the lame man by the right hand and helped him up. And as he did, the man’s feet and ankles were instantly healed and strengthened. He jumped up, stood on his feet, and began to walk! Then, walking, leaping, and praising God, he went into the Temple with them (Acts 3:6-8 NLT). There came also a multitude out of the cities round about unto Jerusalem, bringing sick folks, and them which were vexed with unclean spirits: and they were healed every one (Acts 5:16). For unclean spirits, crying out with a loud voice, came out of many who had them, and many who were paralyzed or lame were healed (Acts 8:7 ESV).